Earlier this year, a farmer from Co Londonderry revealed he had become so disillusioned with farming he was planning to move to Canada to start again. Andrew Evans' farm had been in his family for three generations but he was so frustrated by the challenges facing farmers in Northern Ireland that he put it up for sale. However, his decision to sell up presented a unique opportunity for 28-year-old Sean Devine. The property developer from Park, Co Londonderry, spent his childhood helping out on the family farm and it was always his aim to return to agriculture. Now, five months on, Sean is living his dream. He is the proud owner of the 117-acre farm and has plans to turn it into a successful beef farm. "I don't really remember not being on the farm," he said. "From as far back as I remember, I helped my dad out on the farm and it was something I always wanted to get back into. "He always had me out from I was able to run around. "Having the farm now, it's like I have been rewarded for all the hard work I have put in over the years." After leaving school, Sean spent time living in London working in construction. He moved home where he set up SM Devine Homes, which became a limited company in 2014. Sean has dedicated himself to building a successful business and putting in place a strong team of employees which has allowed him to return to farming. 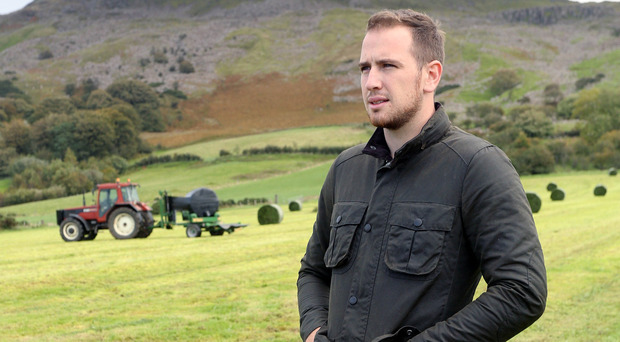 "I was interested in Glenamoyle Farm as soon as I heard it was on the market," said Sean. "The location was perfect for me, as well as the size and it is all in one block, which is great for me so I don't have to travel all over the country farming. "It's surrounded by one fence so I can do it myself, I don't need lots of help. "I decided to go for beef farming because it doesn't take as much time as dairy farming would, for example I don't have to worry about when a cow is going to calve which is a bit disruptive. "We have around 80 to 90 animals on the farm at the moment. "I plan to take them through from about three months up to about 14 months. "I try to get a couple of hours in the morning before work and then I have to be in work right up to five o'clock and then after I finish, I try to spend about two or three hours in the evening as well. "It's challenging at times but I have a good team at SMD Homes and I'm used to doing long hours from I was very young, so it doesn't bother me." Sean plans to increase the herd to 300 in the next few years. "The reason why we are taking things slowly is I want to build things up gradually, so I am in control rather than going in too fast and too quick," he explained. He also plans to buy cattle direct from farms as opposed to going to markets as he said this reduces the stress experienced by the animals. This in turn will improve the quality of meat produced. Sean said the decision to buy the farm was a massive commitment but he paid tribute to Ulster Bank for assisting him in the purchase. "I was actually so impressed at how easy they made the process, it was so straightforward and working in construction and property development, I'm so aware of the challenges that can arise. "However, Ulster Bank worked closely with me throughout the whole process and, from start to finish, the whole process took about three months, which is very quick. "A lot of that is down to Ulster Bank and the help they gave me." Having signed on the dotted line only three months ago, Sean is confident he will make a success of the business. "There's lots of maintenance to do and a mountain of work ahead of me, but there's a great sense of achievement every time I get a job done and get the farm looking better." However, Sean said farming isn't for everyone and advised against getting involved in the industry without extensive experience. He said: "I don't think it would be a good idea. When it comes to farming and even to business, I think you need not to be afraid of hard work. "My experience in the construction industry has helped me as well, it's definitely given me a bit of an advantage and has helped me move forward with the farm." Like many farmers across Northern Ireland, a particular source of concern for Sean is Brexit. While Sean intends to sell his cattle to processing plants in Northern Ireland, he is aware that they will probably want to export at least some of the meat to the EU. Prices for his cattle are likely to be affected as a result. "It's hard to know what's going to happen," he said. "I'm a bit nervous about it as everyone is as we don't really know what Brexit will bring. "Unfortunately that's the most frustrating thing at the moment."